I wasn't expecting a more militaristic book but there you have it. Another good adventure story with ever building stakes for Arthur. Leaf was delightful as always. This might be the best in the series yet. Action packed, quick-paced, shifting viewpoints and parallel stories--I hardly put it down!We begin with Arthur desperately trying to get home, after Wednesday's adventures, only to find that he can't get through the Front Door. As it turns out, this happens to be the least of his problems. Reluctantly he sets off back into the house with his ever-growing staff to hold a meeting.Not long into said meeting, his earthly friend Leaf is sent back home to try to deal with the troubles at hand there, and Arthur, upon finishing his orange juice, comes to find himself drafted into Sir Thursday's army. As all Denizens of the house must do a century of service sometimes in their lives, there's nothing to be done in terms of stopping him going. Which turns out to be a blessing and a curse.As a mortal still, Arthur can be easily wounded or killed. But as Sir Thursday is the next Trustee he must take on, being that much closer could prove helpful. He can seek the next key and part four of the will from the inside while his friends search from the outside.Things get more complicated still, when upon arriving for training Arthur finds himself subjected to the same washing between the ears that all Piper's children get, as it is assumed he is one himself. Therefore he forgets who he is and what he's meant to be doing. Luckily, he fights well and makes it through battle, and eventually recovers his memory. Although as he is now headed straight for the center of the Army's world, he's not entirely thrilled with the revelation.The army attacking the house is like none ever witnessed before, and the battles are being won mostly due to the fact that Tectonic Strategy moves portions of the enemy far away every sundown, splitting its forces. When the plates of the maze stop moving, the real trouble begins.Arthur finds himself not only face-to-face with Sir Thursday, but promoted to his Second Lieutenant for the special mission he's taking on to destroy the spike which has defeated his maze. On this mission they learn the truth of the war, who is leading the enemy, and the perils of his presence. Sir Thursday attempts to escape, only to be caught by Arthur, who confronts him on arrival back at Headquarters. He has been told by part four of the will that anger is the only way to distract Sir Thursday, and only when he is sufficiently distracted can the will break itself free of him. So it is that Arthur comes to claim the fourth key, and frees the will.Back at home Leaf has had her hands full on her own adventure; in the end both sides end well, if slightly worse for the wear. And Arthur is beginning to realize that his hope of remaining human will not last--the Morrow Days will not rest, and without using the Keys' powers he cannot defeat them. As this battle has wound its way into Friday, on his world, there is likely to be no rest between missions yet again. I just cannot say enough good things about this series. I absolutely love the creativity of Garth Nix. Some of the stuff he comes up with is simply brilliant. In this one, I particularly like the tectonic plates strategy. How very clever and original.Once again Arthur Penhaligan is wrapped up in the difficulties with the house and wresting the keys from the bad trustees. This time Sir Thursday gets his crack at Arthur and his allies. Sir Thursday is in charge of the Architect's army and once Arthur is drafted for 100 years of service, the game is squarely in Thursday's court. Of course, while Arthur is literally fighting for his life, the trustees are fighting him on another front as well. They have created a nithling boy to replace Arthur on Earth with the threat of destroying his family so Arthur can not ever return home. So now we have Arthur struggling to fight the nithling army, worrying about his family and trying to wrest the key from Sir Thursday as well as finding the fourth portion of the Will.In case you are wondering about the tectonic plates...the maze of the house is set with different tiles (each one is rather huge). At sundown each day, the majority of the plates shift positions. For example, the plate at location 123,456 may move to location 223,499 which could be many miles away. This allows the denizens of the house to successfully defend the house since they only have to hold out until sundown. Re-read (for the third time) in January 2017.My re-read of this series continues. I won’t be giving a super long review of this book since my thoughts on it are basically the same as my thoughts on the rest of this series. I personally think that this book has the strongest plot of any of the books so far in the series, mostly because it’s the first book that follows a character other than Arthur for a significant portion of time. In my opinion, the two POVs make the story more interesting.My main problem with the third book was that it barely discussed what happened to Leaf. This book had Leaf’s perspective for a significant portion of the book, and I really enjoyed that. Leaf is my second favourite character after Suzy. A new character in this book who I enjoyed reading about was Fred. I remember that he appears later in the series as well.I really enjoy the setting of the maze in this book. I think it’s one of the best settings in the house. I also enjoyed the way that this book was different from the previous three books in a lot of ways, not just in that it had Leaf’s perspective as well as Arthur’s. There was a very interesting thing that happened in the plot of this book that I wish had been explored further, but other than that I really enjoyed re-reading this. Just finished listening to the audio as a "re-read" the series. I recently posted on my review of Drowned Wednesday that it was my favorite of the series, but now I'm torn. I can't decide if I like Drowned Wednesday or Sir Thursday more. I love them each in different ways. I love all the humor in Drowned Wednesday, but I think that Sir Thursday is a more exciting book. Watching Arthur's character development in this book is a real pleasure. From the powerless and frightened asthmatic boy in the first book, Arthur has developed into a real leader in every sense of the word. I love that even in the part where he's lost his memory and doesn't know who he is, the squad starts to look to him as their unofficial leader. His power and his leadership qualities come from within, not as a function of his role in the house or his mastery of the keys.One thing that I can say for certain is that this is one of my favorite series of all time. I'm enjoying it just as much on a reread as I did the first time around, and actually getting more out of it the second time. I'm even thinking about starting over yet another time after I finish all the books in the series so far, because I feel like there's still so much that I'm missing. "I'm just following orders" is probably the worst reason to do something you may not agree with. Authority must be used wisely, and should never be mistaken for knowledge or wisdom. On his way back to the secondary relm Arthur calls home (namely earth) Arthur is drafted into the military doomed to serve the required 100 years, unless he can recover the 4th part of the will and the keys from Sir Thursday. Another fun book with lots of wit and adventure. Read all of the books in the series and it's pretty awesome. Still re-reading this series, but skipping Drowned Wednesday because it's still with a friend of mine.I feel like with this book, the dynamic of the story is starting to stir a bit—actually, it's probably since the Drowned Wednesday one, but still. Arthur acquires more comrades in the form of Leaf, Dr. Scamandros and some other characters from the Wednesday instalment. He also starts to be able to put his foot down on various things and see to his priorities. But, I also feel like the storyline is rather weak, it often skips some parts of the story—which could have been entertaining to read about or given more depths to the characters had it been explored—that makes it feel almost rushed. The writing of the book is certainly more action-packed, leaving almost nothing to the thoughts of the characters—except in a more practical manner. Fortunately, towards the end it started to get quite intriguing with the appearance of an unexpected character and obstacle, although it takes around 2/3 of the book to get to that part—which feels quite tedious, to be honest. The longevity of certain parts of the story really questions the author's priorities, plot-wise.To me, it feels like Garth Nix spends a lot of time on the description of the world and each particular part of the House—including the garments—and leaves very little space for the characters' personalities and bond to develop naturally. The chapters are also not quite well-divided, being broken down in the middle where it feels unnecessary to do so—although it is targeted for young readers who might have trouble reading very long chapters. Lastly, the book—as I think will be more apparent in the later books too—ends very abruptly, leaving a whole lot of questions hanging. It may be due to the desire to create a cliff-hanger, but it is quite poorly done that it almost feels like the author ran out of time—or resources—to actually finish the story.That being said, I'm very intrigued to read Lady Friday. I flat-out love most of the other Garth Nix books that I've read, but for some reason this particular series has never clicked for me. The plots are a bit too formulaic, the setting a bit too generic, and the main character a bit too reactive for me to ever feel truly invested in what's going on. Other readers could well react differently -- particularly those in the intended age group for the series who are less familiar with certain genre tropes -- so if you or your children have enjoyed the first three books in the seven-part series, this middle volume is probably worth picking up as well. But there's none of the growth that I've been expecting from Nix, and no particular evidence that the back half of the series will offer anything different. For me, the week ends here. The more of this series I read the less I like it. It's too formulaic and I just want everything to speed up and get to the end. By now we know that Arthur has to find the next piece of the will and the next key so let's not wasted time with more superfluous world building and just get on to the meat of the story. This book could have been about half as long and then we can just combine all the rest of the opponents into a last book already. I loved how fast paced and intricate the story has become. I also enjoy how Arthur is changing his original stance and coming to terms with the truth. However, there was one part of the book that really bothered me. I think during the edit process Leaf was originally thought to be a character in a scene, but was later replaced with Suzy. So in a scene where Suzy is falling, she is described as Leaf in one sentence and then never again in others. Garth Nix's ability to create fantastic worlds and interesting characters is brilliant. However, I find the books lack as much tension as i would like. But I'm enjoying the intricacies of the overall plot and the politics between the positions of power. Arthur's character has developed a lot over the series, I cant wait to find out what he decides to do. The concept for this world is really fascinating with clocks and time. Arthur was a bit of drag early on, but I realized that it was necessary to his character development. Currently plowing through Lady Friday...Keep up the good work Garth Nix!! Listened to this book. Loving the series and especially the add on characters. Sylvie the elderly pensioner was a gem!!! It's little details like that that make me love these books even more with every one in the series! You can find my full review for Sir Thursday here: https://abhorsenslibrary.tumblr.com/p....Can't wait to continue on and read Lady Friday after concluding this book! I've been reading this series to my youngest child. Much better than the previous volume, this one had a decent sense of suspense and pacing. I now have a little hope for the rest of the series, and hope that they can keep as focused as this one was. More than the next episode in the Keys to the Kingdom series, an expansion of depth of characters, stories, and creativity. Excellent! This series improves as it goes, partially because the female characters become more active in the events. It still has that basis of "the chosen one", but it's not quite as one-dimensional as the earlier books. Arthur is slowly becoming less pathetic, which also helps. A fun, fast, easy read. Every time I've finished one of the novels in this series, I've thought, "This was better than the last!" 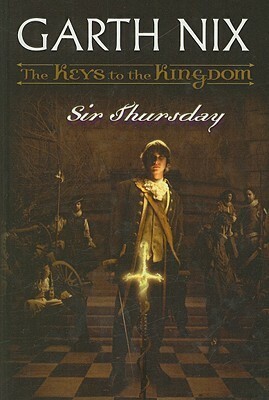 And since I'm 4/7 of the way through Keys to the Kingdom, I figured I'd review the series up to this point, especially since "Sir Thursday" feels like a major turning point in the direction of the story.Keys to the Kingdom is a series about a 12-year-old boy, Arthur Penhaligon, who is somewhat accidentally chosen as the heir to what basically amounts to as the entire universe (obviously there's more to it than that, but that's the Cliffs Notes version). The universe is supposed to be run by the Will, a document set forth by the original creator, the Architect. However, after the Architect disappeared the Will was broken and divided into seven sections, with each section hidden away by one of seven trustees, known as the Morrow Days (each Morrow Day corresponds with a different day of the week - Mister Monday, Grim Tuesday, etc., hence the name). At the beginning of the first book, the first part of the Will escapes and chooses Arthur as the heir to replace the Architect. A reluctant hero for the first three books, Arthur goes along with defeating the Morrow Days and freeing parts of the Will only because the Morrow Days continuously threaten his family and friends; in doing so, they hope to convince Arthur to relinquish his claim as the heir. However, by the time "Sir Thursday" rolls around, Arthur has come to realize (albeit reluctantly) that the only way his loved ones will be safe is to accept that he is the heir and seek out the remaining trustees. First, though, he wants to return home and check on his family one last time... but he can't, because something has taken his place on Earth. And before he can come up with a major plan of action, Arthur is recruited into the Glorious Army of the Architect, run by Sir Thursday.When I started this fourth book in the series, I didn't think I'd enjoy it as much as "Drowned Wednesday," which I LOVED. I'm not a big fan of military stories, but I guess that just goes to show that I shouldn't pre-judge a novel based on its setting! "Sir Thursday" completely sucked me in; I read 3/4 of it in one sitting and was unable to put it down. It helps that Nix alternates chapters in this book between Arthur in the army and his friend Leaf on Earth; instead of spending too much time with one or the other, the balance is just right.Unfortunately, it feels as though Leaf is nothing more than a plot device. I noticed this in "Drowned Wednesday," where her presence was completely pointless, and it continues with "Thursday." Once her role in this book is over, she is conveniently knocked out until the very end. I wish Nix had a better way of integrating her into the story; she's not nearly as interesting or lovable as some of the other characters, like Suzy, but she could be. I found myself really enjoying her chapters in "Sir Thursday," but that was less because I liked Leaf and more because the plot of the Skinless Boy was very interesting. That's not to say I don't like Leaf; she's just very bland and lacks the quirkiness that many of the other characters have. Given her prominent role in this book, though, I'm hoping that I learn to like her more as the series progresses.One thing I absolutely adore about this series is the references to other literary characters and stories. If I had read these books when I was in middle school - the target audience for the series - allusions to Prometheus from Greek mythology and the Mariner from "Rime of the Ancient Mariner" would probably have gone over my head. But the lit nerd in me loves picking up on these tiny details that Nix throws in. There's a lot of foreshadowing in "Sir Thursday" - Dame Primus is acting super shady (more so than usual), Arthur's notions of wrong and right are becoming more muddled, and his concern over becoming less and less human the more he uses magic are just a few examples. I'm looking forward to seeing how this all plays out in the next three books. I also really liked the twist with the Piper, a character who has been mentioned many times but never seen until now.All in all, I'm surprised by how much I'm loving this series. Its target audience is a major factor in why I waited so long to read it; I didn't think that it had anything to offer me, although I'm a huge Garth Nix fan. Just goes to show that a book can be great no matter what age group it's written for.